"46 out of 49," "66 out of 70," and "1 out of 97"
2003 Gloom vs. Spring 2004 Global Warming? February 2003 had a very uncharacteristic SEVEN clear days, temperatures averaging slightly above normal, and wonderful spring bulbs and budding foliage began popping out all over the place! .But on February 28th, that all changed, and March turned miserable with the "Oregon Duck" thing for which Western Oregon is so infamous. 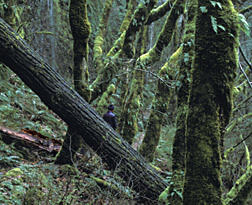 Sufferers of seasonal affective disorder (SAD) sunk deeper and deeper into despair as Spring 2003 developed. It began to rain on Feb. 28th, and did not let up until 28 days later, in the process setting a new March record of 27 straight days with rain..... Surprisingly, the 28 days with measureable rain from Feb. 28 to March 27 only placed tenth in the long-term annual records for "most consecutive days with measureable rain." Grimly, the fact that March had ZERO clear days apparently set no record at all. On March 28, 29th and 30th, the evil weather gods took a small breather, with three cloudy but otherwise dry days, then the gods pulled the rain curtain down hard again, and it has been raining ever since as I write this on April 17th. That's another 18 days straight of rain and another new record. On Feb. 14th, the old record for "consecutive rainy days in April," set in 1958, had already been beaten! So, you ask, what's the outlook for Easter? Wet eggs and wet kids, looks like. The April 17th five-day forecast has a high density of "rain" words, and, dang it, a conspicuous absence of words like "clear," "mostly sunny," or even "partly sunny." Take a look below to see nearby Mt. Hood's snowy version of our Portland gloom. "66 out of 70," May 8 Rain update: Rainy? ..Since the gloom and rain descended in late February, 66 out of the last 70 days have had measureable rain (94%). And I call that DANG RAINY. Sunshine? "Zero and Zero some More"
April 30: So far the 65-day period of February 26 through April 30 has featured a very Oregon Duck-ish ZERO clear days* (definition below). That's correct, not a single clear day in over two months! March 2003 had ZERO clear days, and April 2003 also lanquished with ZERO clear days.... please recall that this period is "Spring Time" in the Willamette Valley, when long-term climate stats claim that our typical winter gloom is supposed to be easing up considerably! Definition: "CLEAR"--- The Weather Service official definition of "clear" does not require a cloudless day with sunshine all day, it merely rates days on a 0-10 scale, and anything from 0-3 cloudiness will be recorded as a "clear" day. "1 out of 97"---Early June Sunshine update: Hallejuah! May 2nd. squeaked into the category of "clear" with a cloudiness rating of 3.... But since the 2nd, there have been no further clear days, so as I write this on June 1, we have had a GRAND TOTAL of a single clear day for the period of February 26th through June 1 (this is 1 out of 97 days, which is a lowly 1 percent of days being clear!). Today's 5-day weather forecast gives much hope that the Willamette Valley's blessed summer weather pattern is finally establishing itself (see * below). March, April, May 2003 Grand Finale count of Clear days: March= zero. April= zero. May= one. THAT'S GLOOMY! June 4: Sunny Spell? ..If you define a "sunny spell" as three days in a row which rate as "clear," then February 6-8 was Portland's last sunny spell--- and as of today, June 4th, we are finally having another Sunny Spell-- which made it it nearly four months between sunny spells in Portland.... I call that GLOOMY SPRING 2003. Extreme Oregon, June 6th. Is this Global Warming? It's a broiling hot 100 degrees today! It's June 6th, and 100 official degrees today where I live near Aurora, and not a cloud in the sky all day.... But then on June 9th we shiver with a high of only 65. "Oregon, A State of Extremes," yes, our State Climatologist really hit it on the head.... Oregon, Green, mild, misty, gloomy, you Liar. You deceiver! The facts, based on official Portland Airport readings: June 4, high of 91. June 5, high of 96. June 6, high of 98. June 7, high of 91.... Records standing for 20-40 years have fallen hard during the past four days. And then we shiver only 3 days later....Is this Global Warming? As a whole, June 2003 continued the Gloomy Spring 2003 trend. There were only 11 clear days, and this despite two raging hot spells during a month that was exceptionally dry--- but not mostly clear and sunny! The extreme temperature fluctuations continued during the month, eg. June 17th with a summery 89 degrees, and June 18th with a high of only 69 on a chilly, bleak day....At June's end, it seemed as though Gloomy Spring 2003 had not yet released its grip..... Check out "Gloomy Spring 2005" to see a similar pattern of a late winter sunny spell, followed by a very depressing Spring/early summer. July 2003 brought what seemed like genuine Summer--some hot weather and almost twice as many clear days as June--- yet Gloomy Spring 2003 was not far away, and a 97 degree reading on July 30th, was followed less than a week later with a chilling daily high of only 68 degrees, which broke long-term records for the date (August 5th)..... If one believes in Global Warming, events like August 5th might lead to a conclusion that, whatever mechanisms fuel global warming, they are not strong enough to offset more routine weather and climate patterns that cause such a cold day to intrude so rudely right into the heart of our Summer-- into what climate records tell us ought to be the three hottest, clearest weeks of summer for the Willamette Valley. August 2003....Hey, Rain Gods, what's happened to the Sun?. It's August 22nd, and so far August has been more or less cloudy, with August 5th having a downright chilly high of only 68, and August 22nd reaching only 69 in both downtown Portland and Salem....The somewhat un-summery official count so far this month-- only 7 clear days, with only a single cloudless day, only one day with a maximum of 90 degrees or more, and six days with measureable rain. Maybe "Gloomy Spring 2003" is never going to leave this year. September 2003.... It's approaching midnight on September 6th, and I hear rain beginning to fall outdoors, with a temperature of 59 degrees. The five-day forecast is for clouds, rain and showers, with daytime temperatures rising to only 65-70 highs. Now it is September 9th, and it rained nearly half an inch today with a high of 63. Are we about to have a "Gloomy Fall 2003?" Heat Wave 2003? I've heard several townfolk this summer complaining about what a scorching hot summer it has been...However, if one defines a "heat wave" as three or more consecutive days with highs of 90 or more, Summer 2003's longest heat wave was a mere four days long! The hottest day was 100 degrees on July 29th. On September 13th the Weather Gods smiled briefly, and for one day we glimpsed Summer again, with a high of 82 on a cloudless day. By September 16th, Timberline Lodge on Mt. Hood had snow falling. A few days later we began a very wonderful Indian Summer period-- Sept. 20-28, which featured Summer 2003's longest clear spell, with nine consecutive days rated as "clear," and a record-breaking 95 degree high on September 27th! October 2003 continued what this writer posits as a climatic change pattern. Briefly, summers in Northwestern Oregon appear to arrive later, and are generally cooler and more cloudy, although not necessarily wetter, than long-term averages.... The Fall-time, on the other hand, appears to have become our most sunny period of the year, and this September/October 2003 certainly substantiated this theory, most especially with a hot spell which began on October 16th and did not end until October 28th-- there were 10 days with highs of 70 or more, including a record-breaking 81 degrees on October 21. Then in late October 2003, a mini-drought began, with only 0.34 inches of rain falling from October 21 to November 9th (20 days). Rainfall normals for this time period would be 2.50 inches, over seven times as much! But despite the drought, the heat and sunniness was over, with these 20 days ushering in some really cold days and only two days rated as clear. In fact, on November 1st, 26 degrees was recorded at the Portland Airport, tying the coldest it had been in all of both 2002 and 2003. Some now believe we may finally experience a truly old-fashioned, frigid winter in the Willamette Valley. Let's wait and see on that...May, 2004 Update: the extreme cold winter did not occur, although there was a notable snow/ice storm in early January..... 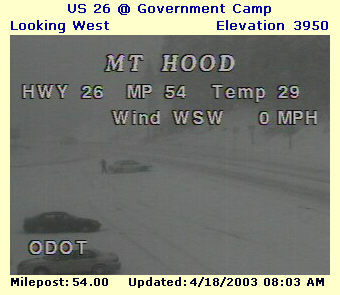 But then April, 2004 ushered in a major heat wave where April had every sembalance of July! April 2004-- Heat Wave Strikes! April 1st began auspiciously with a clear day, then April 3rd hit 80 in some parts of the Willamette Valley, 77 officially at PDX.... April 11 topped 80, with an 81....April 26 came close to 90, with a sweltering 86... Many records were broken during the month-long period of April 3-May 3, 2004, where there were 11 days with highs over 75, and 6 days where the highs were 80 or above...And there were 8 days rating as clear, including three rating a beautiful cloudless "0" (remember that in 2003, March/April/May combined had only a single clear day! )......Officially, April 2004 had the warmest average high temperature ever recorded by the Weather Service in Portland, and also scored the warmest mean temperature for April ever recorded!........2004 was such an unbelievable reversal from Spring 2003's gloom, again reminding us that Oregon is truly "A State of Extremes." ..... Of course, being a State of extremes meant that a big reversal from April's early summer would soon occur. True to form, the gloom rolled in around the first of May, and for the next 38 days , Portland was predominantly cool, rainy and cloudy, with not a single clear day being recorded right up into the middle of June! Of course, Portland's famous Rose Festival had its usual rain and shivery temperatures for the pleasure of the Rose Queen and her Princesses! Note: the above statistics are based on the official measurements at the main Weather Service office at the Portland International Airport (PDX). * The dreamed-for summer weather pattern that brings sunny spells and hot temperatures consists typically of a thermal low nudging up the Oregon Coast to at least the Central Coast, flanked by a strong High pressure area east of the Cascade Mountains. This combination will set up dry, hot easterly winds and often will last for several days to a week or more. On a related note: A "Mediterranean Climate" has been alleged for Western Oregon in some texts I have read, but the assertion seems inaccurate when applied to the Upper Willamette Valley, where summertimes are marked by frequent marine air incursions, "early morning clouds," and even cool rain fronts slipping down from Canada, all of which blight the hopes of any extended periods of hot, dry, sunny weather. Only the Rogue River Valley in Southwestern Oregon comes close to meeting a Mediterranean climate definition, in this writer's opinion, and travelers seeking hot, dry, sunny summers will not be disappointed with the Rogue River Valley!